Businesses, Schools and even Fitness Centers in the Springfield area are on a voyage to healthier snack options with the introduction to Naturals2Go vending machines being offered by Daisy Vending Company. The company offers an alternative to traditional vending machine fare laden with Trans Fat and High Fructose Corn Syrup. Local Springfield residents Keith and Kyuyoung Summers wanted to be involved in a business which could improve people’s diets while reflecting his own active lifestyle. People are more health conscious today - forcing workplaces, schools and gyms to set the example by providing better snack options. Thus, more and more businesses are trying to support people looking for ways to make healthier lifestyle choices. Enter Naturals 2 Go -- an Idaho-based vending company with over 20 years in the business. A company that has wrapped its machine with colorful pictures of fruit, so it really stands out, plus outfitted to accept credit and debit cards as well as cash, and remotely monitored, so they’re never out of stock. Summer’s are passionate about the wellness and food industry and wants to help people with healthier selections. They stand by a company that offers nutritionally sound snacking and beverage options for busy, active people. Healthy vending machines bring natural, organic and preservative-free snacks and beverages to lounges, break rooms, offices or any preferred location. 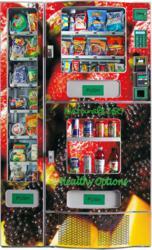 Local businesses love the idea of providing employee’s healthier options in a sophisticated vending machine. Parents equally love the thought of their children not having to settle for sugary, salty snacks and highly caffeinated beverages typically sold in schools. Keith and Kyuyoung have three sons and truly support their community. Keith is active in the community as a volunteer leader in the Cub Scouts and adult volunteer in Boy Scouts for Troop 1853. Keith is recently retired from the US Army, where he was a nuclear and counter proliferation officer. Kyuyoung volunteers her time at the Cottontail pool, where she actively supports her three sons’ activity on the Cottontail Cobias Swim Team.